Have you found an online vendor selling Plantation Guatemala XO Extra Old Reserve ? 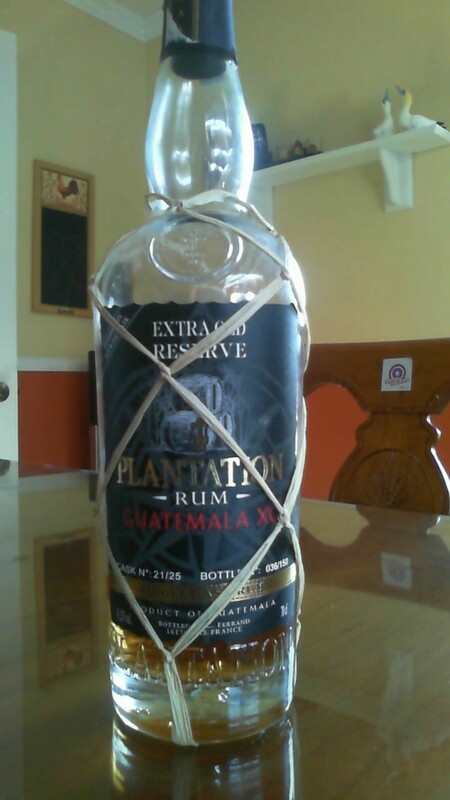 My colleague found a rare bottle of Plantation Guatemala XO and when trying it out, it was like cognac. Super dry, very good flavors though but the burn was bad. He seemed to like it a lot, whereas I was very honest about my disappointment with the Guatemala XO. Barbados XO 20th Anniversary is easily on my Top 10 rum list, whereas this one falls hopelessly short for a very good aged rum definition. Chaleureux et présence marquée de l'alcool (mais pas négativement). Barrique présente, épicé, touche de caramel. Très agréable, très bon ! Warm and marked presence of alcohol (but not negatively). Barrel presence, spicy, touch of caramel. Very nice, very good! I've got bottle 128/150 in the Netherlands. An excellent, smooth choice on ice. Very easy to enjoy. Purchased in Springfield, MA at Table & Vine for $39.99. Plantation is my favorite brand and I usually like everything they make. So here goes... color is a golden amber, a little lighter than other rums. Nose is light with that Plantation flair. Delicate taste, complex middle and easy finish. There is a slight fruit flavor, perhaps banana. Smell is a bit weak. That's about all there is to be said unfortunately. If you know, you know. If you want details, look at my review of Kaniche XO (both made by Maison Ferrand) and imagine a slightly sweeter and less potent version of that, with a little more alcohol burn. This is not bad rum by any stretch of the imagination, but for an older offering from one of my favorite brands, finished in the casks of one of my favorite wines, I feel like this could have been something much more special. Very complex with a great aroma. Best finish of any rum I have had. Try this one, you won't be disappointed. I preferred this as a sipping rum over Appleton Estate 21, Ron Zacapa XO, and El Dorado 15. And that's high praise because I loved those 3 also. I loved the flavour of this rum, sweet but not too sweet, and the bang after swallowing was just perfect - not too much, not too little. Vild med Vin edition cask nr 11/25. Bottle 236/250. Dejligt glas. Ikke den store oplevelse ved duft, hvor en potentiel styrke kan føles. Behagelig smag, en styrke kan mærkes og tiltræder ganske roligt. Eftersmagen er lang. Noget banan, og en sødme kan smages. Kostede 449,- som nypris og i min optik alle pengene værd. Un rhum agréable pour sa douceur. Des arômes caramel et vanille avec une certaine longueur en bouche. I have bottle No 428 out of 450! this needs to btief for at least 15 minutes! it is smooth and with body. Molto buono, proprio qullo che ci si aspetta da un plantation maturo di alto livello. La proporzione di zucchero è perfetta e senza eccessi. .final doux et long. Magnifique avec un cigare. Tout le savoir faire de la maison plantation. Tento zajímavý rum zrál v sudech po ledovém vínu. Sud 1/25, láhev číslo 409/450. Shrnutí: Ochutnal jsem díky českolipskému podniku Kavárna/bar Kocour, kde jsem zakoupil 60 ml vzorky pro další společnou degustaci v Hořicích u josého. Jde o velmi zajímavý rum, s netradičním finišem. Je tak nevšední, že by to chtělo spíš celou lahev, abych mu ještě více přišel na chuť. Z pěti ochutnaných rumů skončil tento v tvrdé konkurenci na 3. místě. The nose is fabulous! More oak and cognac than the expected wine. Not that this is dry, but it is dryer than expected. The finish goes on forever! Cherries, plums, a hint of Jamaica, banana, and the perfect amount of heat too. Interestingly, I purchased this a few years ago, had 1 drink and it got pushed to the back. So now as I revisit an opened and almost full bottle, I think, damn! I should have bought 2! Edit- Two years in, the sugar knocks it down a bit. Iam 100% sure to buy another plantation family member.The Barbados XO 20yo is a must have and this Guatemala XO is a great sipper! Je le recommande a tous. Doux et complexe. Une longue note en bouche. Version finie en fut d'icewine. Rhum facile, doux, nez fruité et gourmand de patisserie. En bouche reste sur les mêmes notes. Équilibré, longueur intéressante mais pas démentielle. Bon produit. Version vieillie en fût de icewine. Nez de caramel légère note de fruits. Goût équilibré,caramel avec vanille douce. Pas trop sucré. Petite note épicée subtile.